As someone still relatively new to precision shooting, I'm lucky to have lot of friends that are great resources. There are industry pros, current and former military and some of the top-place finishers in the competition world. I'm privileged to know some of the best and most experienced long-range shooters in the world. Have your gun fit you. Don't get a barrel burner as your first rifle. Don't get a wildcat cartridge. Watch bullet trace through a good spotting scope to understand wind effects on a bullet. Learn to load good ammo. Stay off of the forums. Every one of these comments could be an article of its own. But when you're as experienced as some of these guys, it can be hard to think like a newbie. Hopefully, I can help with that. I'm going to give you my advice on getting started in precision shooting, starting with the gear you'll need. This is how I got started in the game and what this kind of shooting looks like. So, you'll get some of the learning curve that got me here along the way. I'm here to give you the benefit of my experience. I won't tell you exactly which rifle to get or which scope features you need. This first installment is the buying advice I would have found useful a few years ago. Now, before we start, I'll address the last comment above right now. There is a bottomless hole of things you can learn about this sport online--don't get lost down there. The most valuable thing you can do is go shoot! You can read up a little bit, but don't get hung up on needing the "right gear" before you go to your first competition—just go shoot. Many shooters will let you try the gear they use. This will help you decide if you want or need a particular item. Now, if you're reading this, I'll assume you're not a novice to firearms and know how to use them. The value of a good foundation cannot be underestimated. It's a prerequisite to any shooting sport, especially this one. The very first step for everyone is the purchase of a purpose-built, accurate rifle in some suitable caliber. Like a lot of shooting sports, precision rifle is not a cheap hobby. You can also spend more to get better results, but you don't have to. Better to start with something adequate and upgrade after you've decided this sport is for you. .308 Winchester is an excellent caliber to start with. It is easy to find match ammo, easy to load for and produces accuracy well beyond most people's needs. You'll hear plenty about .260 Rem., 6.5 and 6 Creedmoor, but unless you're already deep into ballistics and reloading, I'd wait. If you're ready to buy your first precision gun, .308 Win. is my recommendation. That said, it was not the caliber for my first long-range rifle. My choice was a 300 Win. Mag. 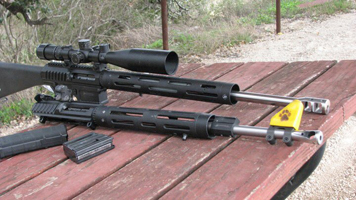 This particular rifle was going to pull double-duty as a long-range heavy hunting rifle. I chose a Remington 700 ADL originally chambered in 7mm mag. I had it re-barreled with a 700 Varmint .308 barrel opened up to 300 Win. Mag. Then, I dropped it into an AICS chassis, put a Nightforce 3-15x50 on it in Warne mounts and rings. Part of the reason here was that I already had a load from a 300 Win. Mag. that was strictly a hunting gun. I tweaked the load slightly and managed to get very respectable velocity and accuracy. More on load development later in a future installment. Shortly into shooting this gun, a good friend and Army AMU shooter offered me a new stock he'd had made to his design. This rifle now sits in a TacMod chassis. I have shot this gun in a couple of matches and done quite well. I placed second in my first true long-range match up at Camp Guernsey in Wyoming. I really appreciated the trajectory and wind-bucking ability of the high BC bullets. When I finally went looking for another caliber to use, I wanted to keep those attributes. Something to keep in mind. Before getting into a new caliber that was a bit more economical than the big 300, I shot a couple of matches that had specific division for.308 Winchester/7.62x51mm. I used a couple of gas guns that produced more than acceptable accuracy: a LaRue OBR and a JP LRP-07. I competed against others that were using custom bolt-action rifles and did not embarrass myself. People will say that bolt guns are more accurate than gas guns. I won't argue that point, but gas guns are plenty accurate enough and less expensive to start with. The Mammoth Sniper match was the first event I tried using a gas gun, the LRP in this case. I learned very quickly what this sport was like and how to handle it. On some stages, we were given target ranges. On others, we were required to range targets as a squad before our shoot time came up. Laser rangefinders (LRF) were not allowed, so everything was milled. As an example, we shot one engagement straddled over the top of a large rock. Targets consisted of suspended golf balls at 100 - 150 yards and tennis balls at 175 - 250 with the longest and shortest distances known. We had a short time limit to hit as many as we could. I chose to dial for what I took as the closest targets and then hold high after that. My plan allowed for maximum shooting time and not having to work a bolt was a definite advantage. Even better was having a mag that held 20 rounds that saved me a reload. By the last stage, I was frustrated with the group milling of targets. Plus, my spotter had not brought suitable clothing for the conditions. With temps barely reaching freezing, he was more concerned with staying warm than giving me good feedback. I gauged the closest targets to be 200-225 yards away with the others approximately 50 yards further in succession. I estimated that the furthest target I had a good chance at hitting was about 550 yards. That meant eight targets I could get hits on. Once time started, sure enough, I got first-round hits on five of the eight targets. I hit all eight quick enough that now I was trying to hit targets I hadn't even considered. 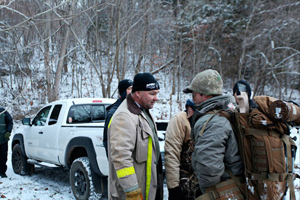 Through the entire match and the miserable conditions, the gun ran without a hitch. When the scores were tallied, I was 5th in a division of 65. The winner of the division was using a bolt gun, but there were two gas gun shooters in the top five. So, don't let others tell you that you need a bolt gun or that a gas gun won't work or be accurate enough. Want to be kept up to date with the latest news from JP Enterprises? Want access to the latest exclusive deals? Click below to subscribe to the JP BULLETin. © 2015 JP Enterprises. All rights reserved.